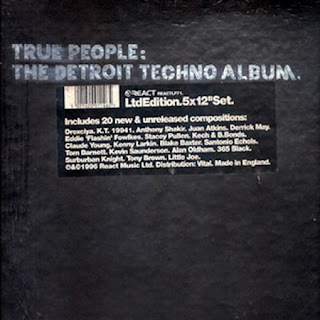 ‘True People: The Detroit Techno Album’ came out on React in 1996 as both a double CD and 5 LP pack. Drexciya’s ‘Davey Jones Locker’ is the opening track and can be found on both formats. The track has never been licensed elsewhere. To be first up on a compilation of this quality is a major vote of confidence from the compiler, Detroit’s legendary Eddie ‘Flashin’ Fowlkes. This must be the friend Stinson mentioned when he was asked in Energy Flash zine how they had got involved with the album. “A close friend asked for our help and we came through. It doesn't make a difference what project we're on, we’re still who we are.” The compilation is made up of new and unreleased tracks from many but not all of the Detroit musical luminaries you would expect from this time period. The only other artist outside them with a direct connection to recording with Underground Resistance would be Suburban Knight, although his track is a pre-UR remix of ‘The Art of Stalking’. But Drexciya are still very much the outsiders on this compilation, although the most prominent group, but that is never a bad thing to be in the long term, it’s one of the reasons why we still listen to and discuss them today. This compilation must have opened so many new people up to them. It’s hard to know what they might have turned down over the years, but things like agreeing to be on this compilation, licensing material to Rephlex so early on in their career and in later years working with Tresor etc, they were making both credible and good commercial decisions which helped them break out from the UR pack and meant that their records could go directly to their biggest market, Europe. The intro of the track goes, “This is Drexciyan Cruiser Control, bubble 1, to Lardossen cruiser 8-203X , please decrease your speed to 1.788.4 kilobahn, thank you, Lardossen cruiser 8-203X please use extra caution as you pass the aqua construction site on the side of the aquabahn , I repeat, proceed with caution.” If it sounds familiar it’s because it is the same intro to ‘Bubble Metropolis’ which can be found on the ‘Drexciya 2' 12" on UR from 1993. I guess it was too good not to use again but has probably now become synonymous with 'Davey Jones Locker'. Incidentally on 'Bubble Metropolis' the same voice comes back in towards the end and speaks along similar lines. I have a link to it below. Knowing that this intro is three years old means the track proper begins with the music which turns out to be a quite dreamy sounding instrumental. There is a prominent piano which plays a loose refrain throughout. Very loose as it’s obviously played live and so has a nice un-programmed, human feel to it. This is juxtaposed with a quite alien and repetitive main rhythm track. Hard to describe these sounds for you but the production manages to be both laid back and insistent at the same time. The choice of sounds used is key here, the beats are very soft with lots of hi-hat and snare throughout. There is also a slightly higher frequency element which is almost threatening in a way which does kind of build over the course of the track and does become more of a focus towards the end. The piano element would most obviously make you think of the Shifted Phases album, it does share the same style of playing but the rhythm track here is not like anything you’d find there. It’s another quite out on its own track for them, another new template they could have explored further if they had wanted. I wouldn't say for me it's one of their best tracks but it is very good nonetheless. I have a theory that a lot of people really rate this one because the intro part sticks in their memory of it but I may be wrong. The name of the track itself might be another hint that Drexciya were over at this point as well, as Davey Jones Locker is the place where sailors go when they die or drown, the bottom of the ocean. The compilation on CD will today cost you about €20 euro, a bit more on vinyl. I would also guess that the track is more “aged wine” as Stinson referred to the tracks on ’The Return of Drexciya’(1996) when again speaking with Energy Flash. Which makes it look like they must have stopped recording new material in late 1995 until whenever they began to work on Neptune‘s Lair (1999). They must have had quite an archive at that point from which they could pick over the next three years for the following releases, ‘The Return of Drexciya’ 12”(1996), ‘Uncharted’12“ (1997), the unreleased tracks on The Quest (1997) and ‘Aquatacizem’ on the Interstellar Fugitives compilation in 1998. This latter track will be our next and final stop on this guide to their Oddities. Zwischenwelt are under the spotlight soon on this website. "to coincide with the new album on rephlex, we will be having a series of zwischenwelt transmissions, each of which explores the project from a different angle/perspective. we are expecting there to be a visual component, followed by a mix, and an interview. both musically and conceptually zwischenwelt is a project that really interests and appeals to mnml ssgs, and we are very excited about how this collaboration will develop." Dopplereffekt caught live in Amsterdam on 26/5/10. Some new tracks but quality is poor on some of these.